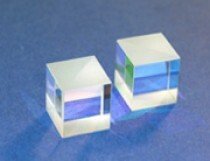 Materials: BK7, fused silica, SF2 or SF5 optical glass. coating applied to the hypotenuse of one prism. P-polarized light transmitted with minimal deviation. Suitable for low power, low energy applications. Input and output faces: Broadband AR coating with R < 0.5%.